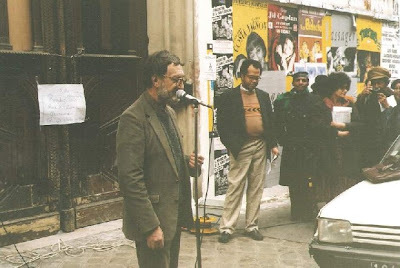 As the month of Richard's Wright's birth comes to a close, and the celebrations of his centennial ring on, I would like to offer these photos as a piece of the memory that still resides in the streets of Paris. 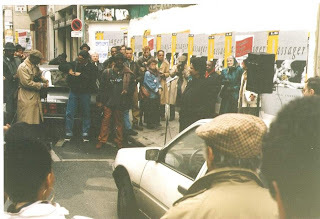 I took the photographs in February 1992 during the "African-Americans and Europe" conference sponsored by the Centre d'Etudes Afro-Americaines de la Sorbonne Nouvelle, Harvard and Columbia Universities and the University of Mississippi. Here, the plaque that still marks Richard Wright's former home on rue Monsieur Le Prince was erected. It was a momentous moment in African-American history - the first official sign of our passage and cultural influence in Paris. It was also a marking moment for me. I had only been in Paris 2 years and knew little of the legacy African-American writers, artists, entertainers, and just plain folk had forged in this city. 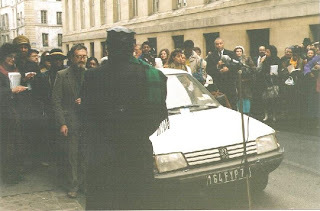 It was during this pilgrimage, that departed from the front entrance of the Sorbonne Nouvelle on the street just behind Monsieur Le Prince, with the late Professor Michel Fabre at the lead, that I decided to create my series of Walking The Spirit Tours and encourage others to come see and feel Black Paris. Here, as the photos show, our hearts were enthralled to take part in the official ceremony, again commented by Professor Fabre and by Julia Wright, and even her son Malcolm. You might even recognize people, or yourself among the participants. Getting the plaque through the French bureaucracy took over two years, I understand, and was spearheaded by young lawyer, Ben Davis (in beige slacks). Today, the building has been royally restored, the front doors draw the hand with their fine etching, and I personally am proud to glance up at it and remember where Richard Wright left his indelible trail. Left to right: Professor Michel Fabre, Ben Davis, Julia Wright. Thanks for your comment, and thanks for introducing me to your fascinating blog! I'll definitely be keeping an eye on it.